This is usually from small business owners who are shopping for a website designer, and just want quick price quotes to compare. And I get that. The problem is that their question is too vague to be able to give a definitive answer. 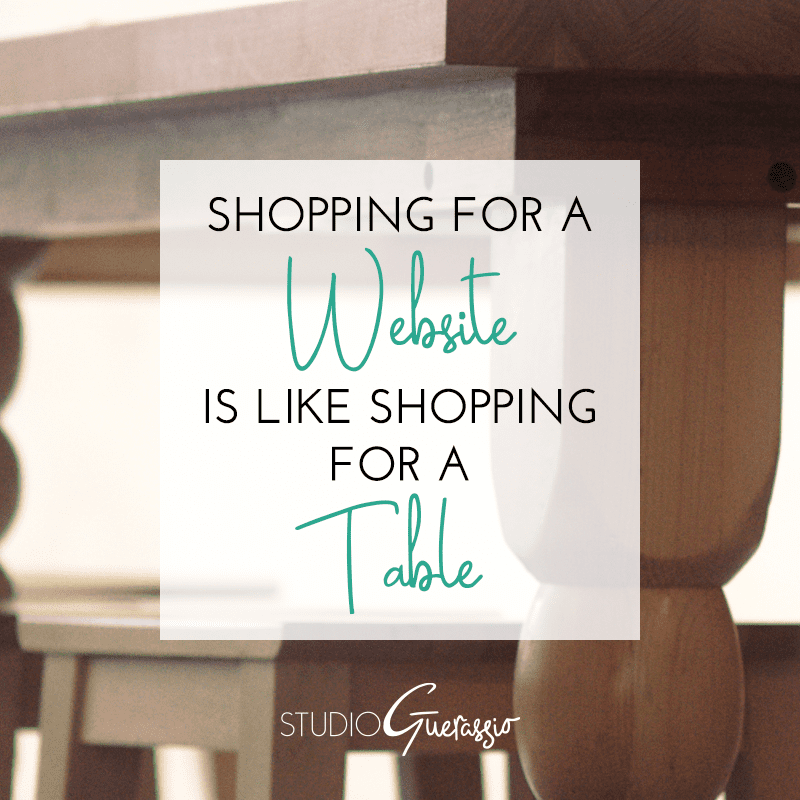 In order to head-off this question, I want you to keep something in mind, all of you small business owners out there: Shopping for a website is like shopping for a table. If you tell a furniture salesperson that you need a table for your living room, that’s not enough detail for them to figure out what you want. Are you looking for a coffee table to hold drinks, remotes, and books? An end table to put a lamp on? A console table as a focal point? Do you need something that doubles as a desk or workspace? What you need the table to do makes a big difference in the kind of table you end up choosing. Websites work the same way. If you approach a designer and simply say “I need a website for my business,” that’s not enough information. What do you need the website to do? Is it simply informational so you have a web presence? Do you need complex contact forms, or to show off a portfolio? Do you need to showcase other types of files, like video or music? Is it simply a landing page for people to sign up for your newsletter? Is there any e-commerce functionality? Do you need something you can run yourself, with a nice admin interface? Do you need a blog? All of these details can change the scope of work, and so change the project price. You pay more for a dining table big enough to fit 20 people than you do for the little end table that goes to the side of your couch and is a foot square. The same goes for websites. A simple 5-page online brochure site is going to cost a lot less than your huge Amazon-equivalent e-commerce site. As it should. I can’t even imagine the teams and teams of people it would take to get a site like Amazon built and running smoothly. And all of those people would need to be paid, aside from the value of the final delivered website. You can bet that project price would be appropriately huge. In contrast, a small business site that just needs to have a few pages of copy and a quick contact form wouldn’t take nearly as much manpower. From a designer’s standpoint, knowing how many pages will need to be set up initially (and whether they need different layouts for different types of content) is a key detail in putting together a quote. What level of quality and customization are you looking for? Just like there’s a difference in pricing between an assemble-it-yourself Ikea table, and something hand-carved from 100-year-old oak just for you, the same is true for websites. The quality and effort involved make a BIG difference in the price tag. What level are you looking for on your website? Also, what can you afford? Having champagne tastes on a beer budget is a problem in the design industry, too. Asking for a completely custom-from-the-ground-up site when you can only afford an off-the-shelf template is wasting everyone’s time. Pricing does range quite a bit, but as a general rule, the more custom and high quality you want, the higher the price tag will climb. Not having a plan can backfire. Have you ever gone to buy a desk or a side table, and didn’t bother to measure first? And then ended up with something that didn’t fit the space, either jutting out too far or not fitting into the space to begin with because it’s just an inch or 2 too big? Yeah. The same thing can happen with your website. It won’t be a physical problem, clearly, but you can certainly end up with a website that isn’t a good fit for your business. It might not have the features you need it to, it might be annoyingly hard to update, it might just be ineffective as a marketing tool. Maybe you didn’t account for mobile users, and it just doesn’t function on a phone. There are so many details that can go wrong or simply be overlooked if you don’t think about them beforehand. You need to plan for your online space as much as you plan your real-world living space. Bottom line: you need to have a long, hard brainstorming session about what you need your site to accomplish and how it needs to work for users before you go shopping for a website. Then, when you ask a designer to provide a quote on building your new website, share that info. They’ll be much better equipped to provide an accurate quote, and you’ll be much more likely to end up with a website that fits your business. I’m curious: what would the table equivalent be for your business? I like to think of mine as a mod, arty coffee table.